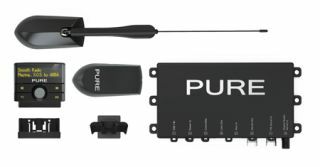 On the road with Pure's Highway 300Di in-car DAB radio | What Hi-Fi? We've had the Pure team down to whathifi.com's HQ fitting out First Test Editor Andy Madden's Vauxhall Astra with the firm's new £180 Highway 300Di in-car DAB radio. Just to recap, Highway 300Di is designed for professional installation rather then the original DIY Highway unit which has been on sale for three years. There are three key parts to the 300Di system: the control unit which goes on the dashboard, the main box of electronics which can be hidden away elsewhere in the car, and a two-part powered DAB aerial (above). It's also compatible with USB devices such as a flash drive, or mobile phones/MP3 players with a USB connection. You can read the full details in our original news story. Anyway, back to our own installation. Andy's Astra is now kitted out and he'll be putting the unit through its paces over the coming weeks, but in the meantime, here's a blow-by-blow record of how the Highway 300Di fits into your car. Our friendly engineer starts pulling Andy's Astra apart. This is definitely a professional installation job, not a DIY one. Halfords will fit the Highway 300Di to your car for free until the end of this year. This is the inside of the powered aerial fixing that sticks to the outside of your windscreen. It can easily be removed if the windscreen has to be replaced. The other part of the aerial fixes to the inside of the screen. The main control unit goes in the glovebox or behind the dash. It has all the sockets you'll need, and routes the DAB signal through the aux in to your existing in-car unit and speakers, or retransmits it via FM. It's getting messy in there: don't panic Andy, they'll put it all back together again together again, promise! The dinky control unit can be fixed anywhere on the dash with a self-adhesive pad and can be removed without damaging the interior finish of your car should you change vehicles. That's better, looking much tidier now! When the Highway is switched on, it will be shown in the main dashboard display. The positioning of the control unit means a couple of minor buttons on the dash are obscured, but they're not used that often, so it shouldn't be too much of a problem. Finally, you can connect your iPod and play that through the system too.